Many have remarked that the ending shots of “War Horse” evoke the feelings and beauty captured in the landscape of classic Hollywood films, from “Gone with the Wind” to just about any John Ford western. And rightfully so, as this feels like a movie straight out of another era, the kind that isn’t made so often nowadays. It has the power to move any viewer, but it might just bring the biggest film admirer to tears. Based on a play which was based on a book (I have not seen or read either), the cinematic version of “War Horse” could not have been brought to life by anyone except for Steven Spielberg. It might seem predictable from start to finish, but there is simply no other way to tell this story. “War Horse” gets off to a slow start, but even the most impatient moviegoer will want to stick it through. In rural Devon, England just before the outbreak of the first World War, a farmer (Peter Mullan) buys a horse for a price more than it appears to be worth. While his wife disapproves, his son Albert (Jeremy Irvine) is infatuated with the horse, but not in an “Equus” kind of way. The horse, whom Albert names Joey, is small but distinctively beautiful, marked by four white socks on his legs and a large white spot on his face. At first, Joey can barely carry a plough but by the end of the movie’s lengthy first hour, he has plowed an entire field. Joey may be smaller than the others, but he is fast and persistent. Then comes The Great War and like most men in the area, Joey is enlisted into battle. He comes into the care of Captain Nicholls (Tom Hiddleston, or F. Scott Fitzgerald in “Midnight in Paris”). After losing Nicholls in battle, Joey ends up in the care of the British, the Germans, and at one point, a young French girl. Albert enlists in the war, in hopes of being reunited with his beloved horse. When it comes to depicting the horrors of war, no one does it better than Spielberg. It is stark realism to the highest, most detailed degree. If “Raiders of the Lost Ark” evoked a young boy playing with action figures in his backyard (as a critic once said), then “War Horse” evokes that young boy who is all grown up, knows history too well, and has sat through every action and adventure movie there is. 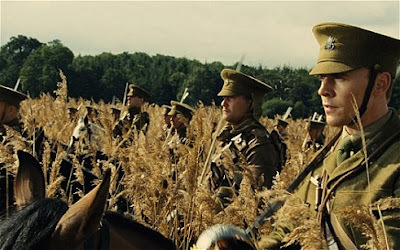 There have been few notable movies made about World War I, and the scenes in “War Horse” which take place in No Man’s Land and the trenches could definitely give “Paths of Glory” a run for its money. It looks exactly like the post apocalyptic hell that it should be depicted as. When it comes to unflinching historical accuracy, no one beats Spielberg. Even when Spielberg fails (and he has before), he never loses his uncanny eye for what elements truly complete a movie. In “War Horse,” every little thing ends up having some sort of payoff. He knows what the viewers wants, but he also knows they shouldn’t have to be cheated in order to get it. Despite having a lot of plain human characters, “War Horse” makes an indelible impact. It is Joey the horse who truly makes it special. If there was an Oscar for animals, he would surely win it. Having Joey as the main character of this movie is something of a small relief, as it is nice to have a totally silent lead character sometimes, and I don’t mean like Ryan Gosling in “Drive” kind of silent. Since horses can’t speak, they use the purest form of acting: the emotions generated by their facial expressions and body language. You can tell when the horse is in physical pain but the more time you spend with Joey, the more you can see emotions that go below the surface. From Joey it is apparent that every living creature feels the effect of war and loss. Think of it as a minor “Consider the Lobster” effect. “War Horse” is many things. It is an underdog story, a tragedy, and a love story in one. It displays Spielberg’s great gift of always being able to shine the beacon of hope into the darkest of times. Spielberg gets to end “War Horse” with the big happy reunion he so often likes to conclude with. But here, it doesn’t feel like schmaltz as it did at the conclusion of “War of the Worlds.” It felt much deeper than that, and totally in place. 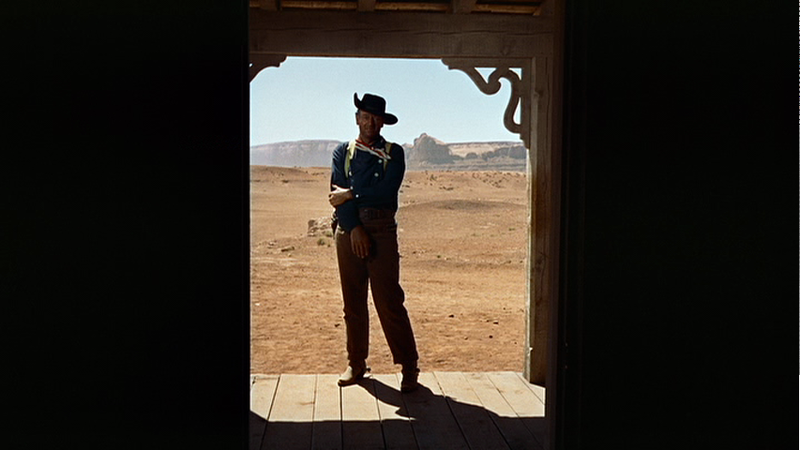 As many before me have pointed out, shades of “The Searchers,” no doubt a huge influence on Spielberg’s career, can be seen here. As Ethan Edwards stood outside the open doors of the house, feeling isolated and overwhelmed by the burdens of both the atrocities he’s seen and the bigotry he feels, is an outsider not just to normal society but even to his own family. As Joey stands just outside the open gate of the loving family’s estate, he probably can’t help but feel the same way. He is loved and many strangers go to great lengths to save him but he is still an animal who has seen more than any can imagine, and in an instant could be traded from one owner to the next. Even if Albert raised him, he will never have one true master. “War Horse” in a sense, is a western, and Joey is its outlaw. 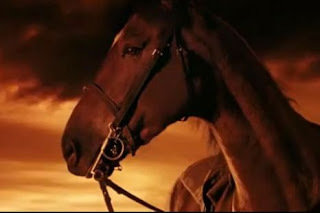 “War Horse” is also the best looking movie to come out this year. From the red sunset to a shot in which an entire army emerges from a field of tall grass, “War Horse” is like looking at a constantly morphing painting. Despite the horrors of war, the beauty of the natural world does not cease to exist. “War Horse” is especially different because of the unique perspective it is told from. It shows that when war breaks out, everybody feels the consequences. It takes a series of contrived coincidences and two and a half very speedy hours to arrive at this point, but when a movie is able to suspend you from disbelief during its entire running time and keep you in that state, it has ultimately done exactly what its supposed to do. I cannot justify the poignance I felt once the movie ended, but the fact that this emotional state stuck with me long after the ending credits rolled shows the subtle and outstanding power of this movie. Just as Joey is not some dumb horse, just as “War Horse” is not some war movie. This entry was posted in Adaptations, British, David Foster Wallace, John Ford, John Wayne, Movie Review, Steven Spielberg, The Searchers, War, War Horse, World War I on January 7, 2012 by ian0592. Nice review Ian. I, for one, am very interested in this movie because Tolkien used his experience in the first World War in the Lord of The Rings trilogy. His job was to train horses before they were sent off into combat, because it was the last war that used calvary to fight. Just FYI, but good job, have fun at Sundance.